What a great weekend I had! Despite this nasty cold still hanging around I had a blast through the coughing and hacking. Friday night was a hoot. We went to the haunted ski area and it was so much fun and scary that I was literally hanging off my roomate. I screamed so hard that it did not help my cold or my voice at all. We then went out for ice cream after and then drove home where I basically collapsed from exhaustion. I slept in my old room on my twin bed, it was a tight squeeze with me and three dogs but we kept each other warm. The next moring I got up early to help my mom with my cousins wedding shower and get ready. The shower was OK, not the highlight of my weekend, but I got through it. Then we headed to the fair where I bet on some of the races, met up with some of my racing friends and hung with my family. My family didn't really walk around and see much so I felt like I hadn't seen everything, I had plans to go back the next day with someone or even by myself. 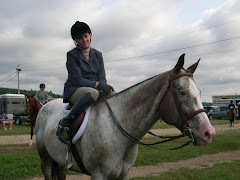 I ended up picking some winners at the races and went through only the swine barn, but did pig out on food. I had pizza, apple crisp, cotton candy and my favorite french fries on the grounds. By 7P I was tired and missing "G" as I had promised to stay at his house Saturday night. I had to walk basically the mile back to my parents truck as they were going to leave later in my moms car. I stopped and switched to my car at my parents, packed the dogs and all of our stuff and drove the hour to my apartment. I then packed a few things and went to "G's" to spend the night. I was so tired and I went right to sleep as he was still watching TV. He was so sweet and rubbed my back and just held me all night. We got up kinds early Sunday and went to breakfast with my family before they drove and flew back home. "G" and I then drive to the fair where we spent a really good day together. We have some similiar interests so we went through all the b arns and went in some expo buildings and then in the evening we watched the truck pulls which is always a favorite of mine. It marks the end of the fair and the fair season here in Maine. LOL I love it! 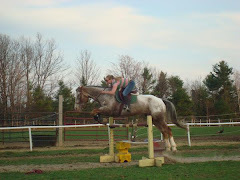 Holy Hannah that was a dayum big steer.... You look like a 3 yr old child perched up there!! My grandparents raised a steer every couple of years when I was little. I used to ride Toro around the pasture. He was as gentle as could be too. Then, one day, as all small children do, I asked what sort of meat we were eating. I was just wanting to know if it was steak or roast or what and my much older brother looked at me, evilly grinned and informed me that it was Toro. I didn't eat meat for quite a while after that. I still miss Toro and have a soft spot for cows to this day. 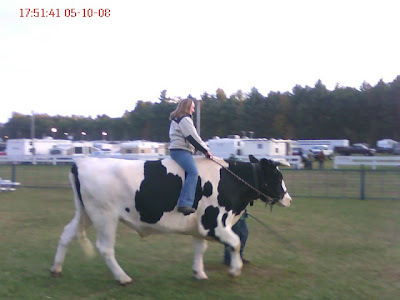 I love cattle, and look at you riding all properly up there on that steer!!! You go girl...lol!! Hope that you are felling better too(everyone is sick right now!). Friends of ours used to have a long horn bull that they rode as an intermission event at rodeo's. Tex is semi-retired now and just poses for pics with people on him. As for your cold, if your throat just needs relief from being sore and scratchy I recommend a "cough medicine" called Nin Jiom. Its a honey based, herbal "cough medicine" that really soothes a sore throat. wow - that is so cool. And, that is one massive bovine. Over 2,000lbs?? 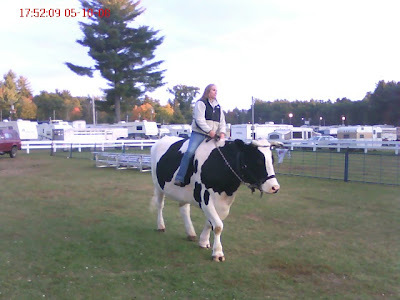 I sometimes forget how big a steer can get. Yikes. Sounds like you had a fun weekend even though you were still fighting off a nasty cold. I can't believe you rode a cow! Was he really bony? It's so cute how you have your heels down and everything. You look like a proper cow-girl!